Empowering future leaders, fostering inclusive collaboration, creating innovative solutions—the mission of the College of Public Affairs and Community Service—shines through to three faculty and staff members as they take on new leadership roles on campus. Omaha – Angela Eikenberry, Ph.D., professor in the School of Public Administration serves as the president of the UNO American Association of University Professors (AAUP), a non-profit professional organization whose general purpose is to maintain and advance professional standards within higher education. Chris Kelly, Ph.D., associate professor in the Department of Gerontology is the current president of UNO Faculty Senate, which features representation from each UNO academic college, Criss Library, and Omaha-based colleges at UNL. Senate members are involved in multiple campus and university-wide committees. Megan Nelson, MPA, career and student services associate in the School of Public Administration serves as president of the UNO Staff Advisory Council (SAC), and organization established in March 1973 to promote and facilitate communication between Managerial/Professional and Office/Service employees of UNO and the Chancellor. 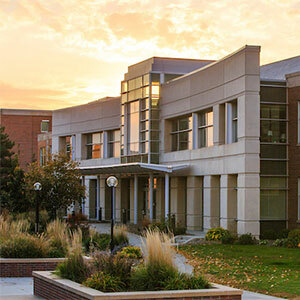 With this unique opportunity—and offices all in one building—the three campus leaders meet regularly to improve collaboration between the organizations. More recently, the group has met to discuss issues pertinent to faculty and staff, collaboration potentials, and ways to improve campus-wide policies. “There are often issues that come up on campus that impact faculty and staff, having our three groups work closely together provides us with better information and influence to improve working conditions for faculty and staff,” said Angela Eikenberry, president of AAUP. “Under our leadership, our three organizations have begun to work more closely on issues of mutual concern, such as maintaining UNO’s institutional autonomy during a time of consolidation across the University system,” said Chris Kelly, president of Faculty Senate. As of late, the group and their organizations are focused on university healthcare changes, budget response team initiatives, and ensuring that faculty and staff are represented in each of these important discussions. “I so appreciate the opportunity to work alongside the great leaders of AAUP and Faculty Senate. Together, our efforts are stronger and more prominent for the entire campus to make impactful changes for all,” states Megan Nelson, president of Staff Advisory Council. The CPACS dynamic shows through in each of these organizations on campus. 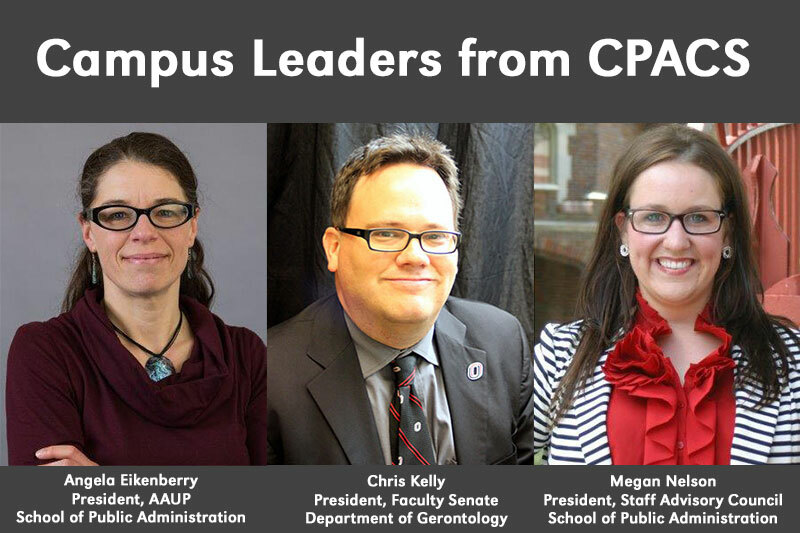 From strategic planning, to policy making, to the care and compassion of others, these leaders are driven by their CPACS roots to serve. To learn more about how each organization represents you as a member of the UNO faculty or staff, visit the their websites or contact the organization’s leadership.